There's a new color challenge blog in town called Colour Me and I decided to join in their first color challenge. I combined that challenge with another new-to-me challenge called Sunday Stamps. There's a funny story behind this card. 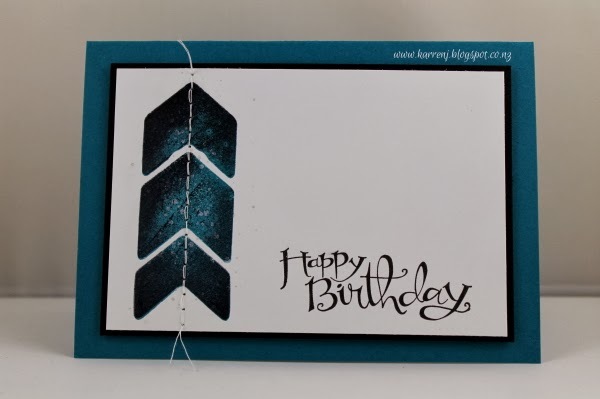 I was using my Charming Chevrons set from CTMH again and I lined up the acrylic stamps on my grid paper before placing my acrylic block on top. I inked up the stamps in Island Indigo ink and carefully stamped them onto the Whisper White. None of the detail in the stamps came out and I figured it was because the ink pad was too juicy. So to fix that problem, I inked up the stamps in Basic Black and over-stamped, thinking that would give me a nice two-tone look. Still no detail. It wasn't until I picked up the acrylic block to clean the stamps that I realised I'd put the stamps on upside down and I was merrily inking the back side! Doh! I actually quite liked the resulting look so I flicked some water drops over to grunge it up a bit and had a new look! In keeping with the sketch, I hand-stitched through the centre of the chevrons. And that's my card - not quite how I envisaged it, but I like it anyway! Thanks for looking and best wishes to the Colour Me team. Edited to Add: This card was a top pick at Sunday Stamps. Ah...the best laid plans, eh? Even if it's not what you had in mind it sure paid off! I love the bold focal image, the stitching and the simple look to it all, perfect for a guy :) So glad you joined us at Colour Me...! this week! Fabulous use of our challenge colour and I love the added detail the stitching provides. 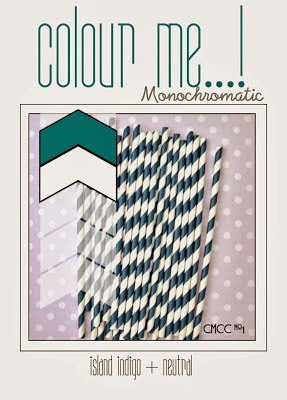 Thanks so much for sharing with us at both Colour Me...! and Sunday Stamps! If only all 'mistakes' could look so good!! haha :) I think it came out fabulously - I love the two-tone look to the chevrons and the stitching down the centre (great touch!). Thanks for joining us at Colour Me...! for our first challenge! Don't you love it when you come up with something totally different from what you intended and you like it! What a wonderful masculine card! Thanks for sharing your wonderful card and the delightful story of how you "adapted" the underside of the stamp to create something new. It didn't look like the Charming Chevron stamp set I have and now I know why. This is a terrific masculine card! 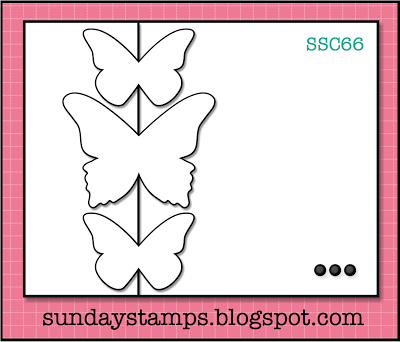 Thanks for playing along with us at Sunday Stamps this fortnight--hope you will join us again soon! Love the simple and clean clean look of your card. Great way to combine both challenges. Thanks for joining us at Sunday Stamps, hope you will join us again. Great mistake! Wish mine looked that good! I love the way the chevrons turned out! Nice! What a fabulous card! I love how you're chevrons turned out. A perfect masculine card, yet could be used for anyone. Thanks for playing along with us at Sunday Stamps. What a great masculine card! Your chevrons do look great and love the stitching detail. Thanks for playing along with us at Sunday Stamps! I have this set in my stash and I haven't used it yet.. I love the cool effect you achieved even if it was a boo boo. It looks Fab! Thanks for joining us at Sunday Stamps!